As with most sports, the younger they start, the faster they tend to pick up good habits. 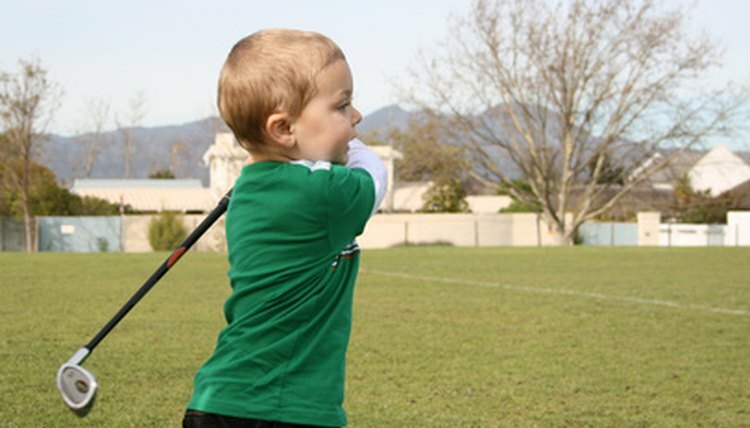 Kids consider golf to be like any other game: fun, exercise and play. They haven't fallen into the trap that golf is difficult, challenging and frustrating. Although getting the kids out on the course is preferable, sometimes the weather is bad or there just isn't time for even nine holes of golf much less 18. Lay out hula hoops of varying sizes and distances. Cut the hoops and re-tape together with duct tape to make them smaller. Set various sized hoops at different distances and angles. For example: The small hoops should be set close, mid-distance and far and to the right and left. The large hoops should be scattered the same way. The object of the game is to pitch the ball into the hoops. Small hoops are worth 10 points, medium-size hoops 5 points and large hoops 3 points. Each player hits a ball to each one of the hoops. The winner is the player with the most points. The game rewards accuracy and patience. The children form teams of two. Begin the game with each team member standing 1 foot apart. The first team member putts the ball to the other team member. It has to hit the other team member's putter. The second team member returns the putt. If the ball misses the putter it has to be played again. When they're both successful in putting the ball, the children take a small step apart and continue the back-and-forth putting. The winner is the team who gets the farthest apart within a 15-minute time limit. This game develops eye-hand coordination. Lay out old golf clubs on the ground like railroad tracks, 1 foot apart. The tracks should be at least 10 feet long. Lay out two tracks for a group of 10 children. The children divide into teams of five. The children hop over the clubs with two feet. Each child has to hop up and back and tag the next child in line to start. The winner is the team to finish first. This builds up leg strength, which is important for a strong drive. Upper body strength is important in golf. Children often have developed leg strength but lack strength in their arms and chest. Empty out the child's golf bag. Have each child lift the bag five times. Add a golf club to the bag. The child lifts the bag another five times. Add another club and so forth. The bag has to be lifted at a slight angle so the clubs don't fall out. The winner is the child who can lift the most clubs.